Experience and Qualifications: Aysha is currently a Vice President and Operations Manager at JLL’s Project and Development Services Group in Manhattan, NY. JLL is a global investment management and professional services company specializing in real estate. Aysha acts as an advisor and strategic partner for all financial, operational and client matters. Her responsibilities include presenting opportunities for advanced productivity through streamlined practices, project delivery and provision of proactive decision-making support to executive leadership. Aysha has over 14 years of architectural design and project management experience. Prior to joining JLL, Aysha was a project manager at Raymond Harris and Associates. She was head of entitlements on all new store construction within the United States, working with planning and zoning commissions, city and town councils and town leadership committees across the country ensuring the approval and development of over one hundred stores during the course of her tenure. Ms. Moore received a Bachelor of Architecture and a Bachelor of Fine Arts in Architecture from Rhode Island School of Design after transferring from Wesleyan University. She is a graduate of Suffield Academy. Personal: Aysha has recently relocated back to Suffield after 10 years in Dallas and has spent the last year restoring one of the town’s oldest historic homes. Aysha is fluent in Spanish and has served as a mentor for youth participating in various programs such as Save Our Seniors, a program geared to encourage inner city youth to complete high school. She attends the 2nd Baptist Church and is the owner of a recalcitrant Yorkie named Lola Falana. Community Involvement: Aysha was recently appointed to serve on Suffield’s 350th Anniversary Committee where she acts as secretary and she is an active Alumni and class agent at Suffield Academy. 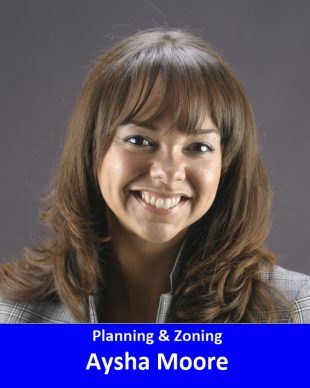 Why Aysha is running for Planning and Zoning: Aysha feels it is important to participate in one’s community and give back. Suffield is home; its history, landscapes and people are a source of pride for her. She is dedicated to using her experience and knowledge to preserve what makes Suffield special, while helping the town formulate a vision for its future.